There's no such thing as making a simple box if you're a woodworker. I wanted to build a container for my reference ruler, or gnomon according to Stephen Shepherd, and had every intention of making a utilitarian one. No problem. I'll fix it with my Lie-Nielsen side rabbet planes. This is a gravy tool—unnecessary, but really nice when you need it. Smoothing the tearout of course made the top edge too narrow, which would leave a gap when the lid was glued in place. No problem. I'll just add some string inlay to fill the gap. While I'm at it, might as well add string inlay to the bottom of the box. 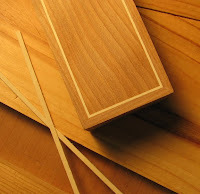 Mitered corners was the joinery of choice for the box, but how do you cut miters on such tiny pieces? It's not very safe with power tools, in my opinion. No problem. I'll just build a miter box and handsaw them. Cutting a perfect guide line for a miter box proved to be more difficult than I thought. Even a slight miscut results in poorly fitting miters. No problem. I'll build a simple miter block (also called miter jack) to trim the miters square. Miter blocks are cool jigs that go for hefty prices at antique auctions and I had planned to build a beefy one with threaded rod someday, not really knowing if they worked well or not. 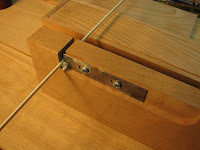 I was shocked at how perfectly this simple jig squared up the miters...and a beefy, threaded rod miter block just moved up the ranks on my to-build list. 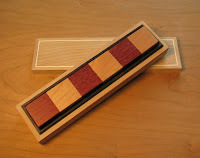 To plane the inlay strips to thickness, I used an invention by Steve Latta that we students made in one of his classes. (Lie-Nielsen now carries this tool.) Basically, it's a piece of steel with a bevel and a burr (like the blade on a scraper plane), that's attached to a block of wood. 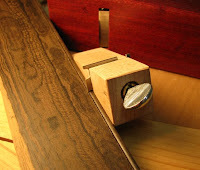 By dragging the inlay through the gap between the burr and the "wall" of wood, the inlay piece is made thinner. After the box was glued up, I cut the lid off at the bandsaw, which resulted in rough surfaces along the cut. Flattening these rough edges is easily achieved by laying a sheet of sandpaper on a flat surface, like your table saw, and "scrubbing" the workpiece until it's dead flat. In order to keep the lid secured, I had to add some insert pieces. But rather than leave the top edges flat, I decided to embellish them with a bead. For this, I used a bead profile in my scratch stock. The miters were cut with the box and block as before. 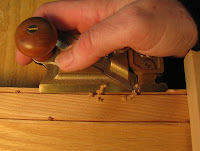 Using a miter block enables you to take very thin shavings so you can sneak up on the final fit. I prefinished the inside with shellac before glue up and had planned to shellac the outside, but the contrast between the unfinished and finished cherry is attractive, so I might just put a couple coats of wax on it instead. What started out as a utiliatrian box project turned into something a little more complicated. But why settle for a shed when you can build a little cottage for your gnomon? Nicely done. Now the old adage applies: Learn skills by making workshop items then make things for the world. Anyway, I think that's what Old Adage said. Ok, that's a great looking box and that's it, that's what I'm talkin about, it's ALL about process - and having fun! For fun and practice I'm making a small dovetailed cedar box to hold honing compound, silicon grit, slip stones and the like - with a kanaban screwed to the lid - so far, I've gotten to play with miter box and saw, marking gauge and knife, dovetail saw, mallet and chisels, block plane, smooth plane, both left and right skew wabbits, yankee screwdriver, various clamps and stops, some glue and paste wax - and my work is so poor I may just do it over - and without complaint. So thanks for the great example. I am curious, what plane did you use with your miter jack to trim your 45's? Anon, you're a woodworker after my own heart! Bill, I used the Krenov-style block plane I made. It's not low angle or anything, just a plain old plane. Kari, that might be the most elegant 'tool box' ever created. But way beyond the demonstrated woodworking expertise, your presentation of this as a series of mis-steps and fixes is simply outstanding, and very fun to read. I agree with Larry, you are a fun read, as well as being informative. The Mishaps followed by your line of though and corrections are a wonderful approach to your blogging. Your blog is the first one I read, because I find it the most interesting. BTW--- the photos are excellent! (Any chance that videos are on the “to-do” list for 2009? Warm wishes for a Merry Christmas, and a Happy and Prosperous New Year to you and yours. Unfortunately I'm stuck with staying inside until the warm months come into play, my Shop isn't heated so I don't go out there in the winter. So I stick with my Scroll Sawing inside where it's warm, at least I can have the best of both worlds, Scrolling in the winter, Woodworking in the Summer. Trying to make sure I understand the design of the box... Is the lid a floating panel in a mitered box lid? Does the stringing inlay take up any spare room you might need for wood movement? Or is this small enough that you weren't really concerned with it? I know people always talk about making sure to design with that in mind, but it tends to be when they're building large pieces of furniture. How does that apply to things like smaller boxes such as yours and the ones I make? I've never had anyone contact me at a later date to say a box split one day for no reason, but... I try to give my lids and bottoms a little wiggle room, just to make sure. Has no one ever called me because I've always left room for wood movement? Or has no one ever called me because the boxes are small enough (and the wood stable enough) that they've never moved that much to cause a problem? I love the inlay in the lid, by the way, Kari. Is that maple? Or holly? I struggle with the concept of the miter blocks. Don't you end up planing away part of the jig when you plane the piece you're trying to fit? How does the jig maintain the correct angle, then? To avoid such plaguing questions, I bid on (and won) an old Delta/Homecraft disc sander a few weeks ago on eBay, complete with the original 1/2" slot miter jig. Now I just need to mount it to a table and find a slow speed motor for it! Village Sexton, there will probably be a video or two in 2009. Merry Christmas and Happy New Year to you, too! Handi, I don't know how woodworkers in the "old days" managed to work in a shop with just a woodstove (or NO heat!). Ethan, it is a floating lid in a mitered box and I did leave a minute amount of space for wood movement, but I doubt it was needed in such a small project. The inlay does not use any of the wiggle room. Instead, the tongue on the lid is wider along the top edge, providing space for the inlay (which is holly). There are tables online for wood movement based on species and width of the board, if you're concerned about how much room to allow. My cherry shop cabinet, which is about 9.5" deep, moves 3/16" inch during the year. 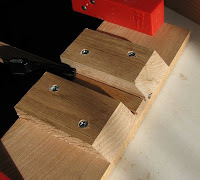 I wondered the same thing about miter jack surfaces wearing away as you plane, and maybe it does a bit, although I didn't notice any, but there is still enough ramp support for your plane. Nice score on the disc sander! As a side note, I found that planing downward with a slight skew, rather than across the grain, worked best with the miter jack. I'm fascinated by this painstaking work, it's very lovely but I am intrigued how you find time for the graphic design. "...I love using shooting boards (and all bench jigs) and have a miter shooting board that works for picture frames (wide pieces of wood) but was not suitable for this. I thought about making one like you're talking about but settled on the miter jack approach. ..."
Rob, is it like a donkey's ear miter board? And I thought Gnomon just lived in the garden! And the LN side rabbets - gravy indeed, but what delicious gravy! My wife gave me those for Christmas a couple of years ago and every time I need them they just make me happy! What a great box! Thanks for sharing the whole process. Dan, it's amazing how a little project can turn into such a production. Those L-N side rabbets are sweet tools and have come in handy on a number of occasions. Did you ever build the miter jack? I have thought about using a very large handscrew as part of the mitre jack, threaded rod and cut two threaded 'blocks' from the handscrew.